Campaign attracts younger visitors to historic music fest. The National Folk Festival has been an institution since the 1930s, but the current base of attendees has been aging—mainly 55 years old and over. So with the help of marketing agency Bouvier Kelly, the organization undertook an effort to attract younger festival goers to the event. 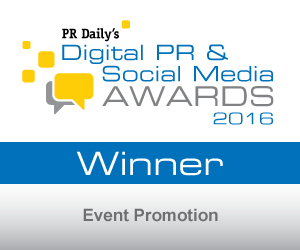 The project has won Bouvier Kelly first place for Event Promotion in PR Daily’s 2016 Digital PR and Social Media Awards. Given the age demographic of its attendees, the Festival had never taken the dive into social media. Bouvier Kelly launched four accounts concurrently and kept them populated with content over three distinct phases. The accounts on Facebook, Twitter, Instagram and YouTube were supported with creative assets gathered in advance, including logos, bios of performers, photos, and videos. The first phase of the campaign across these four social channels focused on building awareness of the Festival. Not one of the accounts had a single follower, so awareness was critical. Employing a hashtag (#WeAreFolk) and targeted Facebook ads, the campaign offered insight into the Festival, from who was performing to volunteer opportunities. The agency also partnered with Amtrak for a contest, the winner of which would get free lodging and round-trip rail transportation to the Festival. The second phase of the camapaign introduced a new hashtag (#DigYourRoots) and went deeper into the Festival with posts about its history and ties to the local community. The final phase focused on attending the Festival. Ultimately, 102,000 people attended the Festival (2,000 more than its goal), and younger demographics dominated the Festival’s 7,600 new Facebook followers. This targeted, phased approach produced results that exceeded goals on-site and online succeeded beyond expectations. Congratulations goes out to Bouvier Kelly’s hard working team for all of their efforts. View More Digital PR Social Media Awards 2016 Winners.